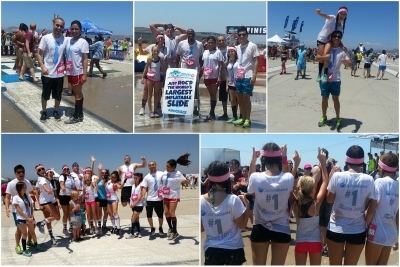 Capital Alliance Group recently participated in the annual Ridiculous Obstacle Challenge (ROC) Race when it stopped by Irvine, CA to raise funds and awareness for the Challenged Athletes Foundation. The ROC Race is a 5K run combined with fun and challenging obstacles that are in the spirit of entertaining obstacle-orientated game shows such as MXC, Wipeout, American Gladiators, and everybody’s Nickelodeon favorite, Double Dare. The ROC Race is held in partnership with the Challenged Athletes Foundation which is a non-profit organization founded to allow those with physical challenges to experience the joy of athletic competition, and everything that goes along with such endeavors, such as camaraderie, team spirit, and just plain fun. And as evidenced by the pictures below, the Capital Alliance Group team had absolute loads of it, making the short trip from their corporate offices in Santa Ana to participate in the event which was held in Irvine. Shannon Webb, a member of Santa Ana’s Capital Alliance Group team, had this to day about the event, “We are extremely passionate about supporting great causes like the Challenged Athletes Foundation and it brings the company together as a team.” Well said Shannon! To read more, please visit CapitalAlliance.com/Capital-Alliance-Group-ROC-Race. Posted on July 29, 2014 by agnesdtodd	Bookmark the permalink.